Phew, that may be the longest title for one of my posts yet! I posted a photo on Instagram last week and said that I was taking time to go over our goals for the year and see how we were doing and what we needed to adjust to reach our goals for the year. I did try to set a weekly schedule for grade two this year and I don’t even know if we completed the first week. I’d like to be the kind of person that set a routine and stuck to it but I am not. Many people assume I’m very type A and maybe in some ways I am but I’ve never been one to stick to a schedule or routine or even complete a month of any 365 challenge. On the Instagram post I shared that I am a Rebel in Gretchen Rubin’s Four Tendencies. I definitely need to re-read Better than Before where she introduced the Four Tendencies and I haven’t even actually read her newest book yet, The Four Tendencies (it’s on my to-read list!). Knowing that I am a Rebel has helped me to realize that schedules and routine just aren’t going to work for me. It doesn’t mean I still don’t try at times, but when I fail I don’t get discouraged. As a Rebel I’ve never actually looked into purchasing a curriculum. There is no way I am going to spend hundreds of dollars to buy something I know I won’t follow beyond the first week (if I even make it that far). The first thing I do is set broad goals for the year. 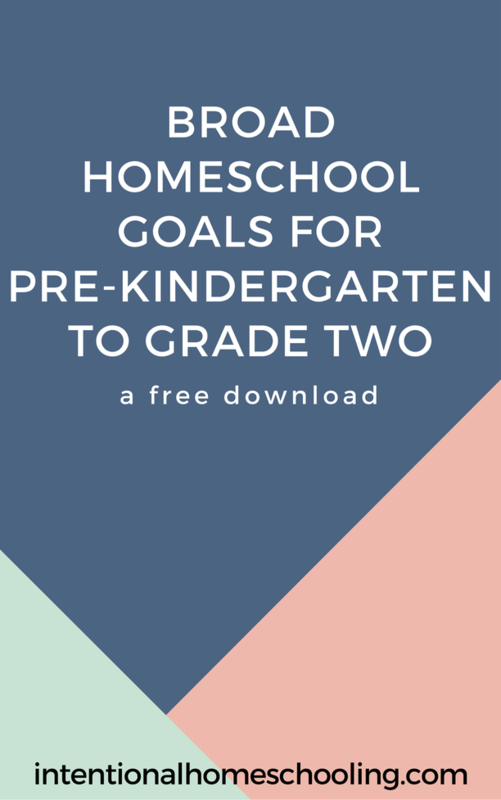 Because I’ve had many people asking how to even come up with these goals I created a list of our goals for each grade from Pre-K – Grade 2, you can download that here. These goals are not necessarily set in stone but like every resource in homeschool I use them as a guideline. If you are a Rebel you probably already do this. 😉 If you are more of a rule follower you may see this as a checklist, it’s not. I’ve come up with these goals through a variety of sources: partly from my education and experience (I have my education degree), partly from how I’ve seen my own kids develop and partly from the good ol’ internet. When I am looking for resources for us to use in the upcoming homeschool year I have my broad goals on hand and pick resources that will help us reach those goals. 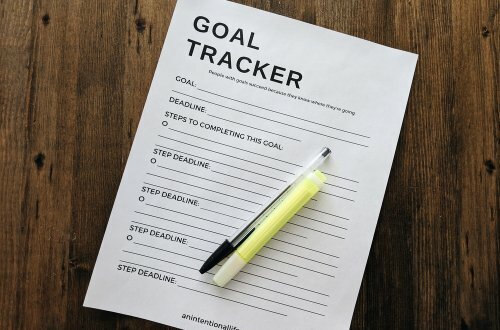 I also refer back periodically throughout the year to see how we are doing and check if there is anything we need to adjust to reach our goals for the year. My favorite resource of all is just reading a lot of good books. I have shared a number of book lists on here and there are so many other books we’ve read that I haven’t shared. Reading is pretty much all we do to cover language arts and history. My main goal when my kids are in pre-kindergarten and kindergarten is to get them reading well (and loving it) because when you can read you can learn just about anything you want. I generally go into the school year with a list of books I would like us to read though other books always come up throughout the year. We also listen to a number of novels on audio. Partly because I’m not great at reading chapter books aloud and partly because then we can listen to them whenever we are driving. Not only do we listen to audiobooks and I read to my kids but they also read aloud (well, Ephraim is in the process of learning), the habit of having them read aloud is pretty much in place of every language arts test for us (well, reading aloud and narration). My daughter usually picks a chapter book to read from and reads a chapter to us a day. I was an avid reader as a child but really didn’t know how to pronounce a lot of words because I just read in my head and I knew what the word meant so I didn’t actually need to know how to say it, I’m trying to avoid this happening with my kids. 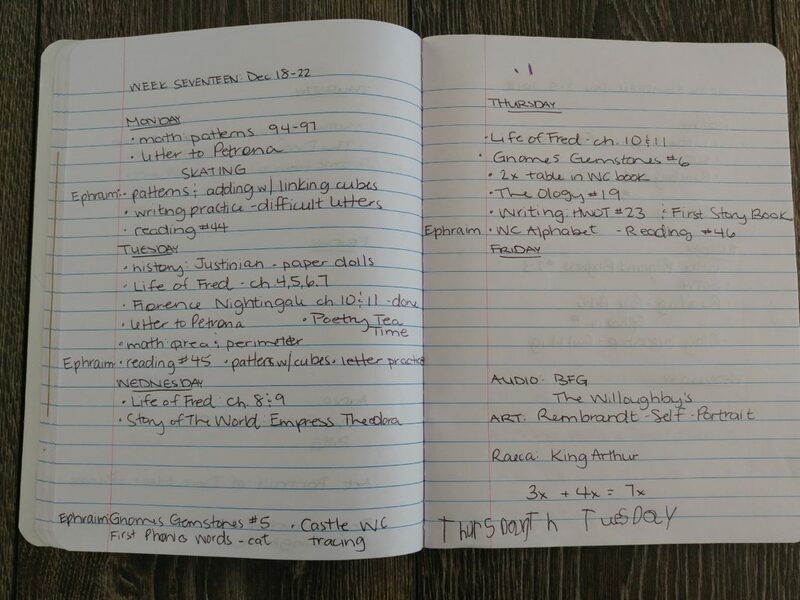 I keep a reverse schedule – instead of writing what I want us to accomplish each day, I write down what we have done. I really like going with the flow in our homeschool. Some days my kids are playing really well together and want to keep doing that so we don’t do much in the way of formal lessons. Sure, it may not look like they are “learning” anything but the skill of being able to get along with a sibling you are around 24/7 is huge. Lots of problem solving taking place. Even on days where they just want to play we still do some “school work”. If I had to give our homeschool method a name right now I think it would be “semi-unschooling” or “unschooling with a plan”. As the kids get older and have more defined interests I wouldn’t mind unschooling, ideally I’d love to worldschool. But for now I am just trying to expose them to a variety of different things and teach them basic concepts. So, I have a composition notebook where I keep track of what we’ve done each week. This is also helpful for the end of the school year when I need to send in a monthly log to our school division. 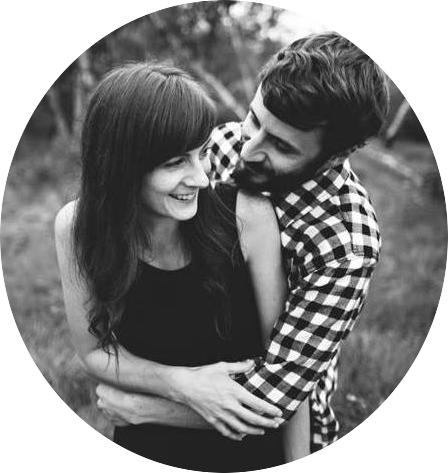 So, that’s a bit of insight on how I play and keep track of our homeschool year and the goals we have for each year! 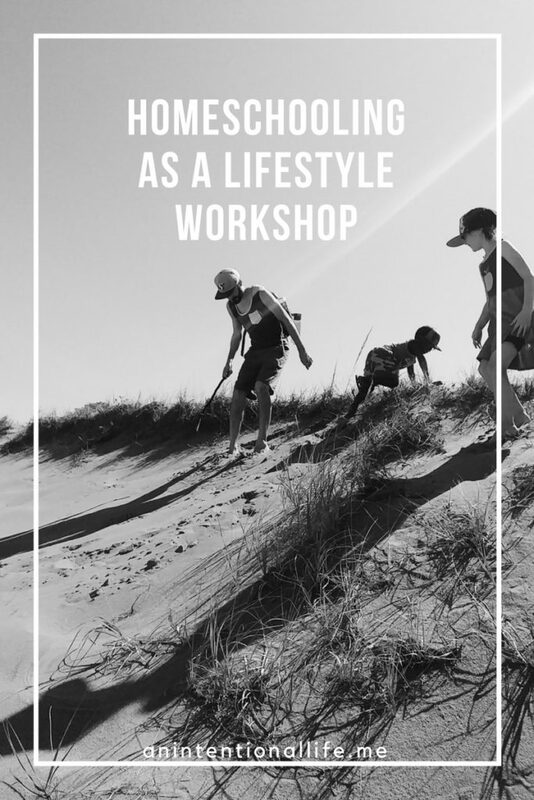 If this type of homeschooling sounds like something that interests you, you may be interested in checking out my Homeschooling as a Lifestyle Workshop. This is so so helpful! I have tried to set up schedules and create my own curriculum, but I’ve found what works best is to have a general idea of where we’re going and some activities ready to pull out and then to do them when the timing seems right. 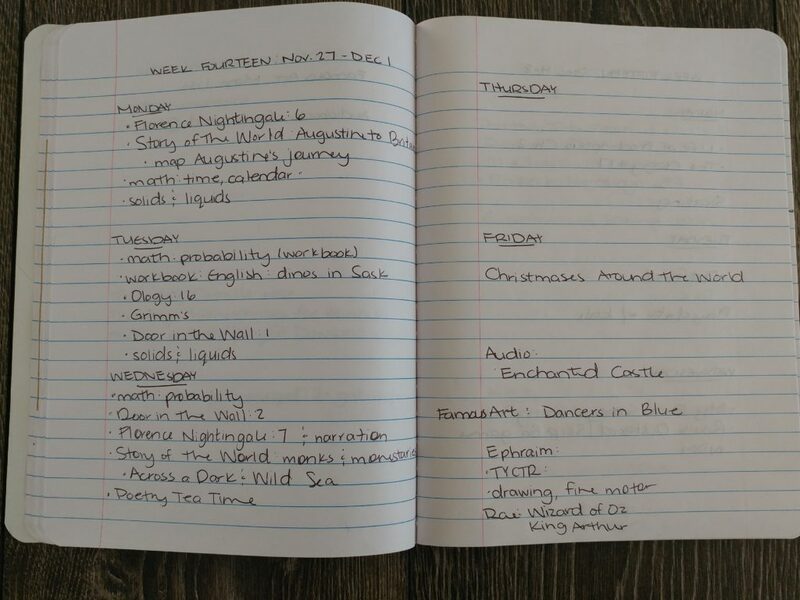 I also write down what we’ve done vs what we will do…I use a teacher planner with subject s across the top and days of the week down the side. 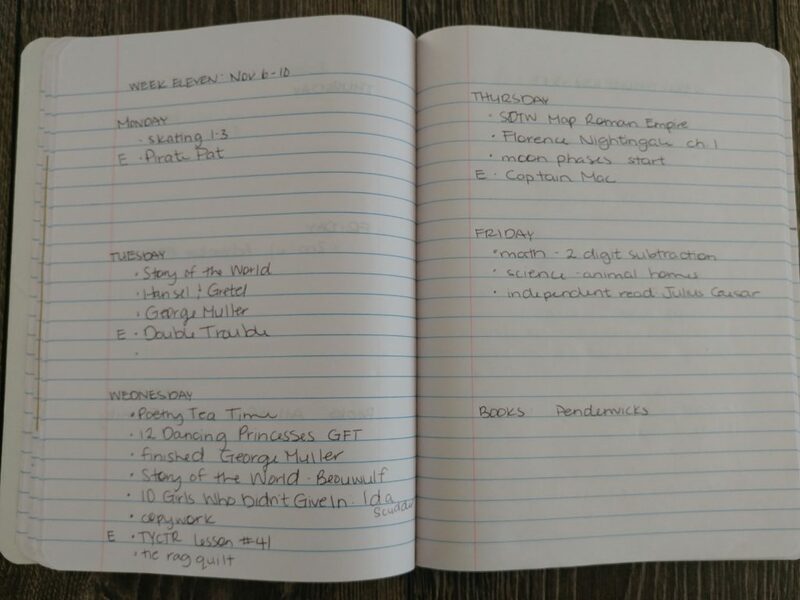 But I like the idea of just using a composition notebook! Hi Katie – thanks for taking the time to read this post and leave a comment! Isn’t it nice knowing there are others out there that are doing the same general non-schedule thing?! 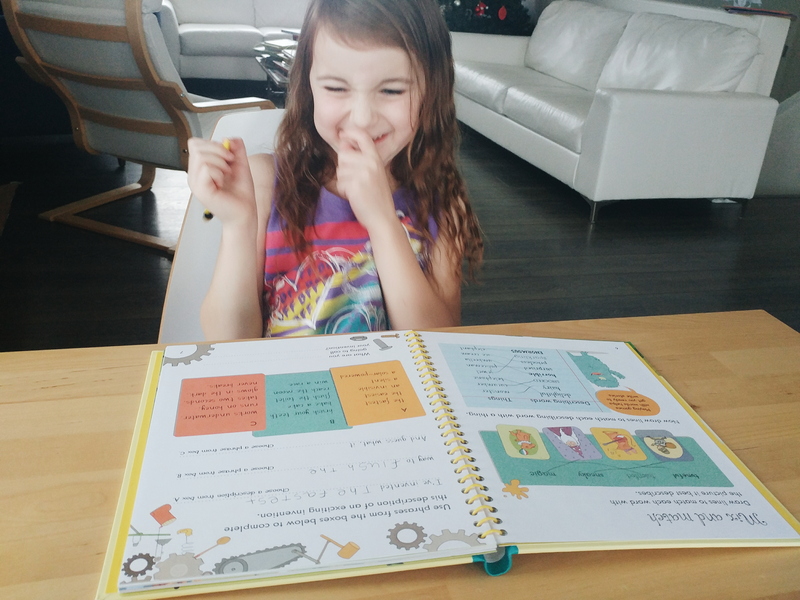 I’m a Questioner, but have Obliger tendencies 🙂 I feel like I am constantly re-evaluating our homeschool rhythms and materials. I’ve tried curriculum packages, but have found that we cannot possibly use all of the material they send. I loved the ease of having everything laid out for me, but I hated seeing so many boxes left unchecked at the end of the day. I have a 9 year-old son who has severe learning problems and behavioral issues, so I’ve had to pare down our school time to focus especially on math, reading, and some review of the material we cover in our homeschool community each week. He also attends occupational therapy sessions and reading tutoring twice a week. I will say that homeschooling is nothing like I dreamily imagined it to be when our oldest son was a baby. God is teaching me how to love him and teach him at the same time!!! So for this semester we are spending two hours or so doing “real” school–math and math games, reading and language arts-related stuff, and review (lots of movement–we like to take a long walk while we do review!) And the rest of the day is for chores and being outside. My son loves to just wander around in the yard, building things, playing in the creek behind our house, all while listening to free audiobooks from librivox.org. 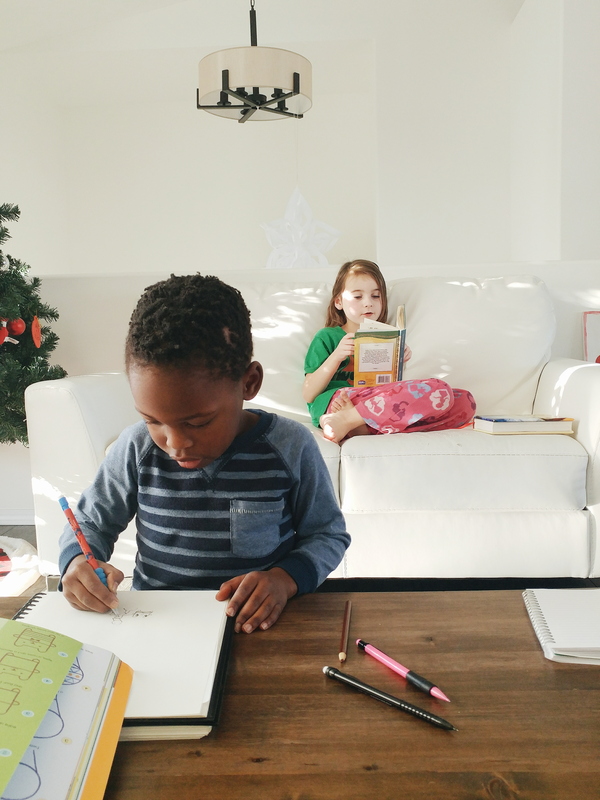 Again–it is not at all what I envisioned homeschooling to be, and there is maybe a lot more freedom than I imagined that we would have–but, so far, I have been a lot happier with the free time we have. I have begun walking daily in the afternoons, which is so good for my mind and attitude. On Fridays my husband plans to spend the entire day with our son–they’ll work in the yard or take on some other big project. We thought that this might be a way to educate him in some very practical ways. I have enjoyed reading your blog posts–just came across your blog last week and appreciate your thoughts on the homeschool journey. Thanks for sharing what you’ve learned! Hi Julie – thanks for your long message! Our homeschool isn’t what I imagined either but I’ve learned to love our flexibility and freedom. I love the that Friday’s are days for a big project, what a great idea! I read The Unhurried Homeschooler a few years ago, I think it’s time for a re-read because I don’t remember anything from it anymore . . . Thank you so much for this. I don’t know anything about the Tendencies you referred to, but I am learning that I am a reverse scheduler. If the kids are playing well, I don’t want to interrupt that. So, if I have written down something that I had planned to to, it really bugs me that it’s there “unchecked”. Yep, I’m a weirdo! Lol. But, I’m learning more about myself in the process. In these early years, learning to read and loving to read are my goals for both, as well as introducing them to amazing new things/ideas through books. Hey Sarah – yay for reverse scheduling! I love hearing that there are others out there that do it as well! And I’m also with you on being bugged when things are left unchecked! Wow, I had no idea there was a name for what I’m doing! 😉 We just started homeschooling this year; I have a 6 y.o. kindergartner and a 4 y.o. Pre-K, and I found that planning too much just caused problems when we didn’t get to certain things (sometimes because we did other things, or the list was too ambitious). And it just stressed me out. So I just started writing everything we did in a given day at the end of the day, both to make myself feel better when I saw what we DID do, and to see if we weren’t getting to something often enough that I thought was a priority. I’m soooo going to call it reverse scheduling now. 😀 Thank you also for the general list of yearly goals! Very helpful for my kids’ ages. Hi Kristi – I’m glad this post could be of help to you! 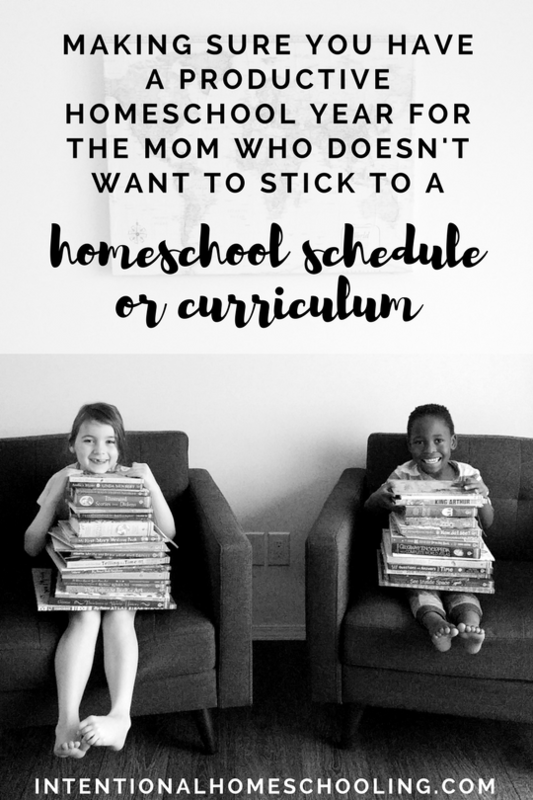 In the land of homeschooling it seems like so many people are the scheduling planning type so I like hearing that there are some fellow reverse schedulers out there! I haven’t gotten to where I need to write down things for the kids yet, but I definitely reverse schedule myself and my menu planning. Which doesn’t work as well at around 5 pm, but that’s what generally happens! This is the way we homeschool too! One book that really helped me is Teaching from Rest by Sarah McKenzie. My oldest is in third and I’ve found this reverse scheduling along with loop scheduling works the best for us. I started recording a reverse plan this year too! Glad I’m not the only one, everyone else seems to have a much more planned out schedule then me! Yay for another reverse planner! While I do buy a curriculum kit, we follow through the subjects at our own pace. Some days it’s 2-3 lessons, other days we don’t touch curriculum workbooks. I do not write out long drawn out lesson plans. I’ve tried and failed with follow through every.single.time. , no matter what kind of planner I used. I too keep 2 spiral notebooks with the purposes of 1.) goals & 2.) I write down what we have done that day. I feel like this way works so much better for us. I know what we have done and accomplished and what we need to work towards in a time frame. But if we don’t accomplish said goals by a certain date, that’s fine, we work at my daughters pace until we reach it in her own time. And I’ve learned that is what works best for both her and me . With that said , this is what makes our days smoothest and to make me feel like I’m not failing if I don’t check off my list each day, month or semester and I have a record of what we have accomplished. Which when I look back through the months of the year is so much, even when I don’t see the every day little hurdles we jumped. Thank you for your post, it makes me happy to know I’m Not the only homeschooler who does not write lesson plans or keeps a strict schedule. I like how you make a curriculum kit work for you. If I were to ever purchase one I think that’s the way I would have to use it as well. What kind of kits have you all been liking? I like the idea of kits but the couple that we’ve had ended up just not getting used. So, I guess no tips on how to get things done . . . 😉 Maybe I’ll learn some down the road!